The Department of Veterans Affairs is a federal agency that provides healthcare services to eligible military veterans at VA medical centers throughout the country. In addition to healthcare services, they also offer several non-healthcare benefits like education assistance, home loans, and life insurance. Boxer is proud to support veterans and veteran-owned businesses and is pleased to recognize this organization during the Veteran’s Day week. With an estimated 3 million veteran-owned and/or –operated businesses in our country, it is no surprise that there are numerous organizations and associations that offer help to veteran owned and operated businesses. There are online directories that list small, medium, and large businesses owned by veterans, which offer badges and logos for businesses to proudly display to let customers know they are veterans. Among programs that support veterans includes Google’s Veteran-Owned Business badge that helps veterans differentiate their business online within Google search listings as well as a special jobs for veterans option which helps veterans match their military experience with civilian jobs that require similar skills. Other benefits of running a veteran owned and registered business are tax relief, better access to capital, extra support if your startup or small business is poised for high growth and innovation, and many other things. Hiring veterans is often a goal for businesses. Boxer is proud to be among those businesses that hire veterans. In honor of Veterans Day, we would like to thank all men and women who serve and have served in our country. 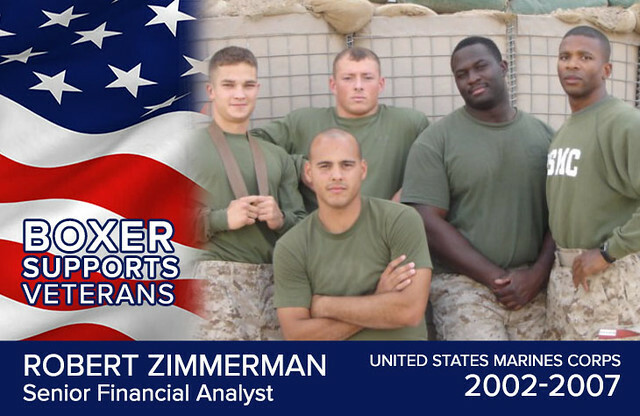 Take a look at our veteran team members who have proudly served their country. Previous Previous post: Boxerween Costume Contest Winners!